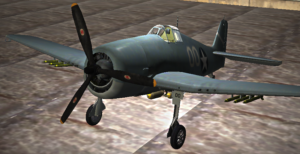 The Grumman F6F Hellcat is an American carrier-based fighter aircraft of World War II. Designed to replace the earlier F4F Wildcat and to counter the Japanese Mitsubishi A6M Zero, it was the United States Navy’s dominant fighter in the second half of the Pacific War. 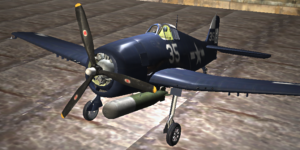 The Hellcat competed with the faster Vought F4U Corsair for that role and prevailed, as the Corsair had significant issues with carrier landings. The Corsair instead was primarily deployed to great effect in land-based use by the U.S. Marine Corps. Powered by a 2,000 hp Pratt & Whitney R-2800 Double Wasp, the same power plant used for both the Corsair and the United States Army Air Forces (USAAF) Republic P-47 Thunderbolt fighters, the F6F was an entirely new design, but it still resembled the Wildcat in many ways. Some military observers tagged the Hellcat as the “Wildcat’s big brother”.